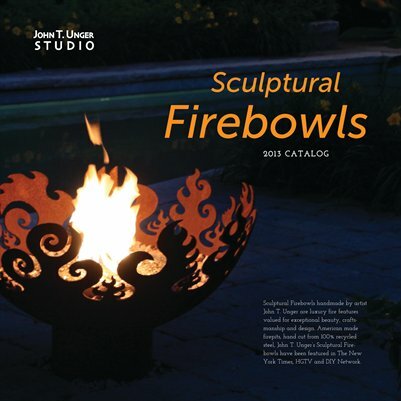 I’m very proud of our new 2015 Sculptural Firebowl Catalog designed by Reese Spykerman at Design by Reese. More than just a simple catalog, Reese put together a beautiful 38 page art book. We chose a 12″ x 12″ format that allows the photos to really show the firebowls in their best light. Preview the catalog in the browser (note: looks a little blurry while loading). Download a free PDF or iPad version. Purchase a print copy of the catalog. Magcloud’s print pricing is exceptional, as the same size catalog on other print-on-demand services came to almost $70. The only drawback is that we were restricted to a wire binding rather than the stitched binding I would have preferred. It’s easier to update, edit and make changes. There’s no waste when information changes and suddenly a box of brochures becomes a doorstop. Costs are lower, both environmentally and financially. Information can be searched, shared, and quoted easily. 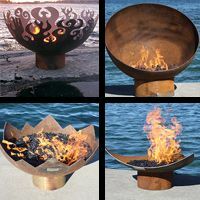 This catalog contains all the Sculptural Firebowl Designs I currently offer, some of which are only available directly from the artist. Galleries and dealers should use the Showroom Catalog instead, which shows only the designs available to retailers. To apply for an account and get the Trade Catalog fill out our application here.